We are offering Small Aerobic Step to our client. - Size : L-68 x W-28 x H-15 cms. - Height adjustable with adjustment blocks upto 6". - Non slip surface to give more safe grip. Banking on the skills of our qualified team of professionals, we are instrumental in offering supreme quality range of Plastic Aerobic Step . 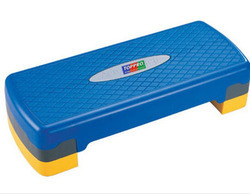 Owing to years of practice, we are providing a quality assured series of Foot Step Board. To obtain the patron’s approval, professionals also check this product on different industry parameters.